I like this view. It reads and depicts in a compact message. There is something about normal lenses, non? Thanks! This photo really turned out, didn’t it? I didn’t put a ton of thought into it, but the composition feels right and then the sharpness and tonality are good, too. Hey, I know that bridge. I know. It told me to say hello. You sure got a timeless look in this photo. That bridge seems to have held up well. At least I think the Monon line has been defunct for a long time. I have seen video from the 40’s and 50’s of trains on this line. Certainly riding one of those trains would be something that I would like to go back in time for. Thanks! I haven’t shot that 55mm f/1.8 lens since this time – I really need to get it out again and use it. It clearly loved the T-Max 400 film. 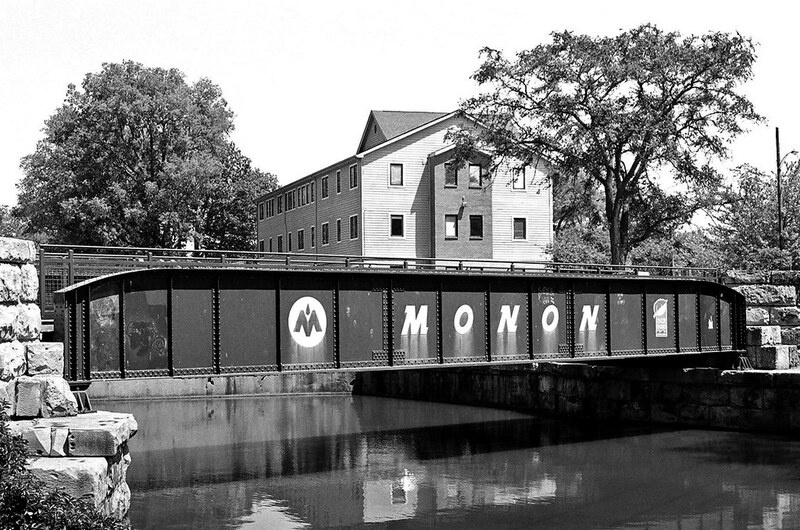 The Monon is defunct. The railbed is used as a trail now. Thanks! It did turn out, didn’t it.